Zimmerman Trial: L.A. Mayor Calls For Calm After Violent Protests : The Two-Way Eric Garcetti said while the trial in Florida may have " ignited passions," it should not "ignite the city." Los Angeles police said beginning Tuesday officers will take a "stricter posture" on demonstrations. 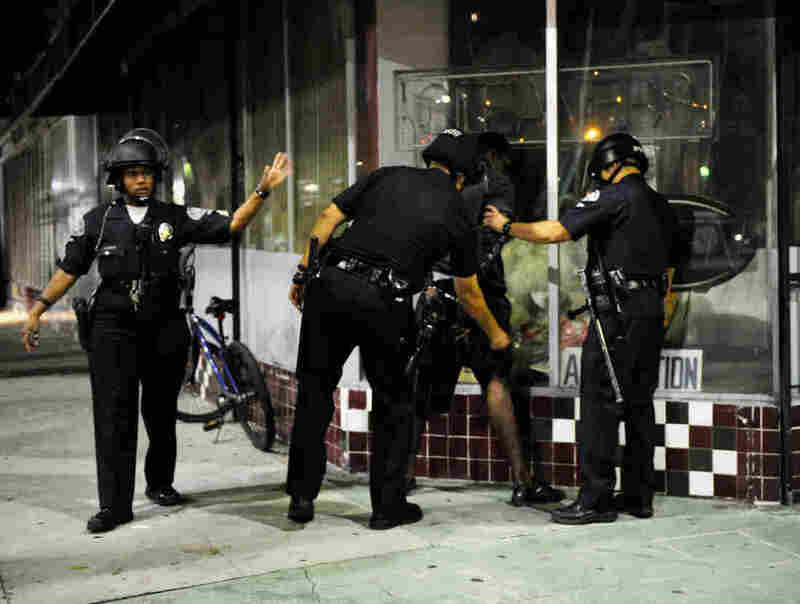 Los Angeles Police Department officers in riot gear detain a man after disturbances in the streets around Leimert Park. Late into the night on Monday, after a round of violent protests ripped through Los Angeles in response to the acquittal of George Zimmerman, Mayor Eric Garcetti called for calm. The Los Angeles Times reports that by the time the sun came up, at least 13 people had been arrested after police say they began breaking windows and stopping traffic. "The trial that we saw in Florida has ignited passions, but we have to make sure it will not ignite the city," Garcetti said at a late-night press briefing, according to NPR member station KPCC. "The Martin family was very clear — that those who sympathize with their plight, the best way to honor their son and their loved one is in a non-violent manner." KPCC reports that the demonstration began as a peaceful one in South Los Angeles. A few hundred people gathered in Leimert Park for a vigil. One protester told reporter Erika Aguilar that she came out because she was "just upset with the justice system." As the crowd swelled, the Los Angeles Police Department declared it an unlawful assembly, allowing officers to arrest those who remained on the streets. The New York Times says that's when a group of about 150 broke off from the protest and began "committing vandalism and assaults." "In Sanford, Fla., where the killing took place, things remained largely quiet on Monday, a marked contrast to the situation a year ago when tens of thousands of protesters demanded Mr. Zimmerman's arrest. Extra police officers went on patrol and grocery stores hired more security guards. Convenience store clerks asked to be allowed to leave early when a verdict was near." KPCC reports that police in Los Angeles have decided to take a "stricter posture" beginning today. Farther north in the state, protesters in Oakland briefly blocked Interstate 880. The San Francisco Chronicle reports that as the crowd moved through downtown, they smashed windows and spray-painted graffiti on buildings. Police made at least nine arrests.